A fine collection of old-school gaming homages. We've already had a taste of Wreck-it Ralph in the form of Fix-it Felix Jr., a little slice of old-school gaming that introduced the titular character from Disney's recent movie to the mobile gaming world. For the uninitiated, Ralph stars in the film as a Donkey Kong-like villain, desperate to escape his role as the videogame bad guy and emerge a hero. 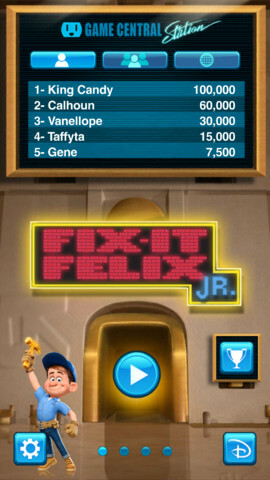 This latest mobile release packs in three games themed around that film, one of which is Fix It Felix Jr. itself. We'll focus on the two new additions to the bundle in this particular review, suffice to say that Felix is a pretty faithful homage to early console platform gaming, with the lead character rushing around to repair apartment block windows, while dodging the bricks thrown downwards by a very angry Ralph. 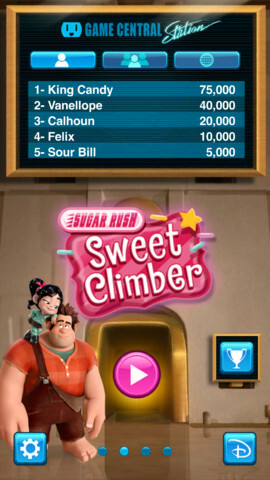 It's a little unfortunate that the weakest of the three games on offer, Sweet Climber, is the next one presented in this mobile collection. It's an endlessly sprawling, vertical climbing game that features Ralph himself being propelled upwards from one bouncy sugar-cane branch to the next, while you tilt to stop him falling beneath the bottom of the screen. It's somewhat fun for what it is, but the tilt controls are very stiff and the cause of many a premature death for our hero. 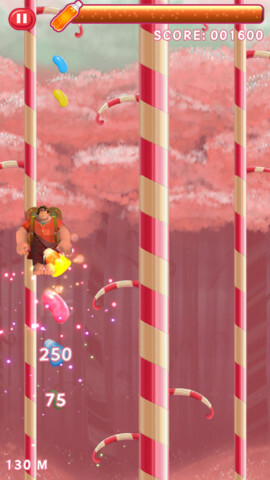 The candies you collect along the way add to your score, and picking up soda cans allows you to send Ralph whooshing up the screen for a little distance boost. It's unlikely to be the section of Wreck-it Ralph you spend the most of your time in, but it entertains for a little while. Hero's Duty rounds off the trilogy here, and is a vastly different offering from the previous games. Taking its cues from games like Robotron 2084, and the more recent delights of Geometry Wars, this is a top-down, twin-stick shooter where you guide Sergeant Calhoun around a series of increasingly frantic arenas, destroying wave after wave of deadly Cy-Bugs. It's great fun and the challenge is perfectly tuned. While it's generally a more forgiving game than most twin-stick shooters, the usual strategy of circling each arena while issuing strafing fire is complicated by the addition of obstacles later on, creating a maze around the arena that requires careful forward-planning. Fortunately there's a delicious selection of upgrades to pick up, from laser beams to grenade launchers. Like the health bar, these are metered and don't last forever, but they add a very satisfying twist to the carnage nevertheless. Any one of these three games, taken on their own, would probably struggle to bear the cost of this game when compared to the competition. Together though they offer a combination of just enough variety and old-school addictiveness to make the overall package worthy of your time and money. What's Hot: A surprisingly good movie tie-in game, with enough compelling content between the three titles to impress. What's Not: Sweet Climber is more miss than hit, with controls that need a little extra polish.